After a historic triple in the 50-100-200m freestyle at the 2016 Australian Championships (including a remarkable 47.04 in the 100m), Cameron McEvoy has his eye on an Olympic hat-trick in Rio. Only 2 swimmers have managed to win a medal in the 3 sprint events at the same Games: the American Matt Biondi (Seoul 1988) and the Dutchman Pieter van den Hoogenband (Sydney 2000). Nicknamed "the Professor", McEvoy is also a physics and mathematics student. The 22-year-old burst onto the international scene at the 2011 World Junior Championships, with a double in the 50-100m freestyle. 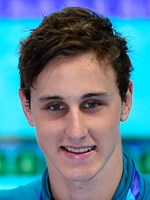 At London 2012, he took part in heats for the freestyle relays, but he travels to Rio as Australia's biggest star.